Pilgrimage 1436AH/2015CE has been struck by twin tragedies. The first one happened at the very beginning of the Haj rites, when a heavy construction crane fell in the Grand Mosque in Makkah killing about a hundred people. The next one took place, when the faithful were stoning the Satans in Mina. This time the toll was much higher. Hundreds were killed and many more were injured. The first one may be attributed to some technical flaw. The official explanation blamed gale force winds that caused the crane to crash and kill all those who came in the way. The second accident happened due to a stampede that may have been caused because some pilgrims going against the human traffic. Haj management has improved over the years. In previous years when tents catching fire due to cooking stoves and stampedes were the norm. Saudi government has made all efforts to streamline the haj facilities e.g. no cooking is permitted in the camps and the stoning of the devil is done from different levels and only one way traffic flow is allowed. Deaths during Haj are something that cannot be prevented. This year alone over 3 million performed haj. Many of them are old and infirm, particularly those hailing from the South Asian subcontinent and are not ideally suited to withstand the rigors of the physical activity that is part of the pilgrimage. Many actually want to die and be buried on hallowed grounds. Sometime this death wish can acquire the urgency of a self-fulfilling prophecy. After the heavy casualties during this haj season, I am sure the haj managers and the Saudi government will review its procedures and make a thorough audit of why things went wrong and how it can be prevented in the future. I feel any improvement in future haj plan should also include suggestions from the common pilgrim. A random selection of hajis from across the Muslim world would provide good inputs. I feel that VIPs get an infinitely better deal the common pilgrim, therefore, there is a need to listen to him/her. There is also a need for more technological solutions for avoiding disasters e.g. mobile phone applications can be developed for the hajis that can tell them about potential traffic jams at the places for stoning or even during circumambulation around the holy Kaaba and while walking briskly and running between the hillocks of Safa and Marwa in the tradition of Hagar (Hajra the wife of Prophet Abraham). Reuniting lost Hajis with their families can also be done through technological means. 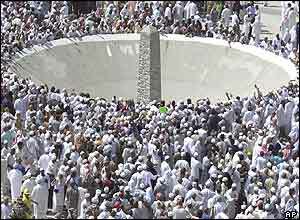 Preventing jams and stampedes is a major challenge for any operation of the scale of Haj. Logistics such as providing food and water to the pilgrims has been mastered to a great detail but the movement of hajis from one place to another has not. A train service has been launched but it has met with mixed results so far. Meanwhile it is interesting to note that the Pope while addressing the US Congress has advised the congressmen to accept immigrants with open arms. In contrast the khutba at Arafat did mention the deviants at large and in Yemen in particular but there was no mention of the tragedy that has forced many Muslims from Syria, Afghanistan and even Pakistan to flee to Europe in search for better life by risking life and limb during the perilous journey across wilderness and sea, at the mercy of the human smugglers and the elements of nature.